Despite the fact it’s July, things still haven’t really cleared up here in Englaterre and although i’d like to think i'm sitting in parks and outside cafes cooling down on iced teas and iced lattes, I’m not. I’m still sitting inside, I’m still hoarding teas and dried herbs and spices for brewing, and my minimum of 3 cups of something hot and herbal per day is not about to change. For years I’ve been buying dried herbs, spices and roots to make my own loose tea. My local health food shop has an in house herbalist and an apothecary of these ingredients so I am always experimenting with new combinations, designed to give different benefits and to sooth different ailments, illnesses and moods. Fresh herbal teas are far more healing and on a different flavour level entirely than tea bag teas. For ease, I use tea bag teas when travelling or in a rush, but for genuine health benefits, energy boosts and meditative benefits, as well as intensified flavours, i much prefer loose leaf. 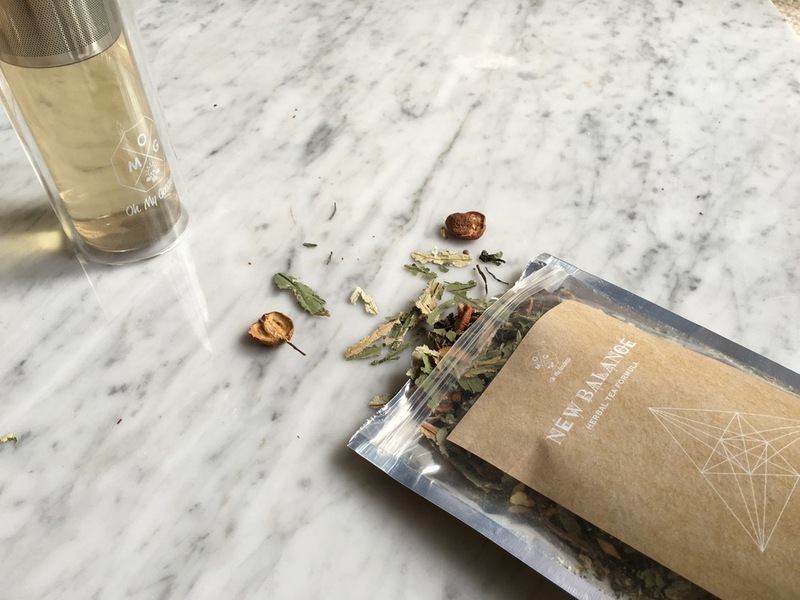 Oh My Goodness are a young brand specialising in creative, premixed loose tea blends, including combinations like New Balance and She Glows, each of which has been curated from carefully selected ingredients aimed at rebalancing certain imbalances within the body/mind/both. To compliment their range of teas, they’ve also developed a beautiful loose leaf brewing flask, which goes by the name of G-tank - ideal for making teas wherever you are, and taking them anywhere with you. Whether you're living out of a hotel room, constantly on the go, staying abroad or even working at a desk all day, the G-tank makes brewing and drinking loose tea easier than ever. With a removable tea strainer, it is practical, versatile and easy to clean. You don't need a tea strainer or a tea strainer stand to drain the loose tea in, you simply fill up the flask and away you go. The longer you leave it to brew, the more beautiful it becomes, as the ingredients infuse the water. It's basically like the lava lamp of all portable bottles. I love their New Balance tea, containing Oolong tea, Sencha tea, Premium green tea, Cassia seeds, Lotus leaf, Hawthorn berry, Radish seeds, Barley malt, Cinnamon, and Orange peel. The benefits of this blend include fat loss, detoxification, reduced bloating, healthy digestion, improved concentration, elevated immunity and stress reduction. + I add juiced ginger or pomegranate to flask too, to add even more flavour and detoxifying side effects.